Directed by Joseph “Tron: Legacy” Kosinski, Oblivion is the movie adaptation of the graphic novel co-written with Arvid Nelson for Radical Comics. It takes place in the year 2077, more than 60 years after Earth was attacked by a race of aliens known only to humans as “Scavengers” (or “Scavs” for short). Technician Jack Harper (Tom Cruise) is one of the last few humans stationed on earth. In a few weeks, his mission will be complete and he will join the rest of humanity on Saturn’s moon Titan since earth has been ruined in the great war with the aliens, during which the moon exploded, sending the planet into upheaval. Harper’s job is to maintain the drones while extracting Earth’s resources, especially water. His partner and communications officer is “Victoria” (Andrea Riseborough). Both have had their minds erased with a security measure to prevent any information being extracted from them should they be captured by the resistance on the surface. But Jack is having flashbacks of a mysterious woman in New York before the war. When a spaceship crashes and he finds that exact same woman (Olga Kurylenko) in a pod, he takes her back to his vessel in the clouds. 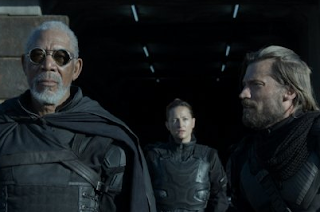 When the two are eventually captured and brought to a Scav compound, he acquires information from the group’s leader (Morgan Freeman) that will clash with everything he has come to know about the war and humanity’s struggle to survive. 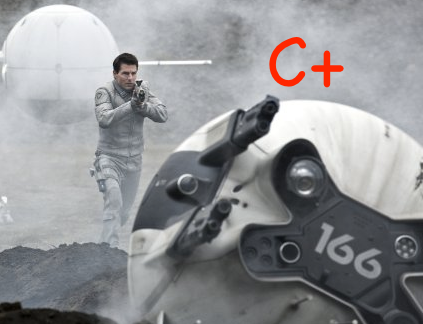 After a somewhat slow opening, not a lot of time is wasted in demonstrating clearly that Oblivion is dramatically torn between being a dedicated sci-fi and a love story with preference given to neither. As a sci-fi, it shows off wherever it can. Cruise gives it his expected best—even when he’s holding his futuristic guns that remind us, with whines and little lights, how futury they are supposed to be. Cylinders and drone memory banks glow (they can’t just work and be metal like normal technology) and scans of bodies from way up in the clouds can read someone’s DNA. The machines work right when they are needed always. Fuel for renegade ships is apparently available even when on the run, and clones are easily made and work in close proximity to each other. And there is a lot of blue everywhere. Yes, Oblivion always reminds us it wants to be a sci-fi big-hitter. It is definitely an overachiever in this regard. While Cruise brings back his always-relatable breakout hero persona, he has a hard time making connections with anyone else (but through no fault of his own). The interpersonal dynamics tend to border on hollow. The film tries to capture some deep romantic themes, but the story bogs down and takes some work to fully understand. It does, however, keep our attention all the while, and even reaches out to honor classic literature. But despite its best efforts, it still seems a bit lifeless. These save-the-earth apocalyptic movies have become rather narrow, with emphasis upon a) save the planet, and b) fight the higher-ups responsible for the whole mess. It’s the same big eco-message we’ve gotten used to, and that is taken to an even higher level with elements of the story that feel undermined by what can only raise questions (like why the earth seems to have temperate weather without a moon or why no one seems to spend too much time worrying about how and where to get food). The details are layered in very well, but go too far, such as memory wipes, radiation zones, and other elements that eventually make sense, but do not allow enough space to appreciate the pressures from the war. The story mechanics could have used some tightening to make it less difficult to relate to the overall struggle. The level of satisfaction the film leaves behind is mediocre at best. Those who fall on the fringes of loving deep stories might hold this one in high regard, but the project will likely remain 50/50 split in ratings.